Mary Lyon Hall at Wheaton College in Norton, Massachusetts. A 385 acre picturesque campus with a variety of meeting spaces, top-notch catering services, state of the art athletic facilities and dedicated staff to help you plan your next event in Norton, Massachussets. 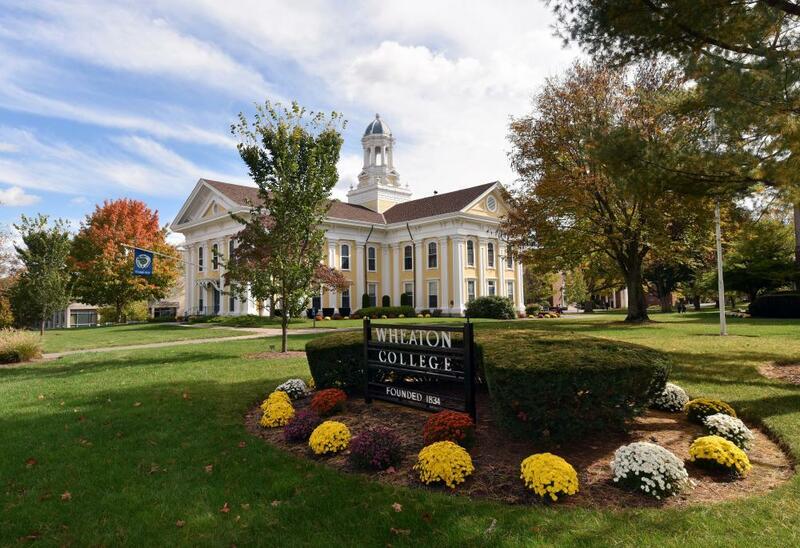 Below you can find even more attributes that make Wheaton College the premier Norton event venue. All facilities available June - mid-August. Limited meeting rooms available year-round. Air conditioned classrooms with a combination of Mac's & PC's with internet connections. Recently renovated multi-media auditorium for 200. Dining services staff work with each group to design a menu that fits their needs. Cafeteria style meals are also available. Educational based or youth athletic groups preferred. Meeting and Multi-Function Rooms, Classrooms, Athletic Space, Recreation Space, Dining Spaces and Residence Halls	 Spaces are available to reserve for your event on campus. Meeting rooms range from casually decorated locations in our Campus Center that can accommodate groups of 12-30 guests to more historic rooms in our Library that seat 20-25 guests. Multi-function spaces are available in several buildings providing open areas suitable for receptions, plated meals and exhibits for events with up to 150 people in some cases and can even include the use of Cole Memorial Chapel which has been the host to a variety of performances, lectures and events for up to 700 guests. No space is cookie–cutter, that is to say, available for only one type of use or another. We are pleased to say that creativity is always welcome here as we utilize spaces in non-traditional ways. Madeline Clark Wallace Library	 Greenaway Room, boardrooms set up for formal meetings with media. Watson Fine Arts	 Haas Concourse, open area often used for receptions or small gatherings. Balfour Hood Campus Center	 Lyons Lounge & Conference Room, offers both casual and formal meeting settings with media. Mary Lyon Hall	 May Room, parlor-style space with multi-purpose capability. Mary Lyon Hall	 Woolley Room, open floor space for multiple layouts. On site catering is provided by Aramark and includes personalized menus tailored to your event’s theme and budget, group meal plans, beverage services and professional wait staff. Dining spaces on campus are available for traditional, cafeteria-style meal service, plated meals, receptions and more! The Chase Dining Complex looks out over Peacock Pond and Chapel Field. Emerson Dining Hall is part of the college’s original “court of honor” on the upper campus and boasts a stately dark wood-lined dining room with high ceilings. Each location offers a different feel and atmosphere and can accommodate a variety of events and specialized menu options to meet your every need. Personal Event Planning Services	 Each event booked on our campus is assigned a member of our professional event staff to ensure all event details are thoroughly organized and every customer is highly satisfied. Concierge Services	 Assistance with guest check in, registration, room keys and check out. Catering Services	 On site catering is provided by Aramark and includes personalized menus tailored to your event’s theme and budget, group meal plans, beverage services and professional wait staff. Media Services	 Staff can provide and support your event’s technological needs with equipment for power point presentations, slide shows, internet usage, audio files, videography and more! Athletic & Recreation Options	 Guests will be able to utilize the on-campus Fitness Center, Olympic-qualifying pool, indoor track, outdoor tennis courts, walking trails and paths, multipurpose field areas and comfortable, serene outdoor spaces for any level of interest and activity. 24 Hour Campus Safety Services	 Our guests have peace of mind knowing certified first-responders are on campus at all times. Auxiliary Services	 Convenience items and services can be located throughout the campus such as an ATM machine, copy services, vending machines, public internet access, free Wi-Fi access and public transportation.